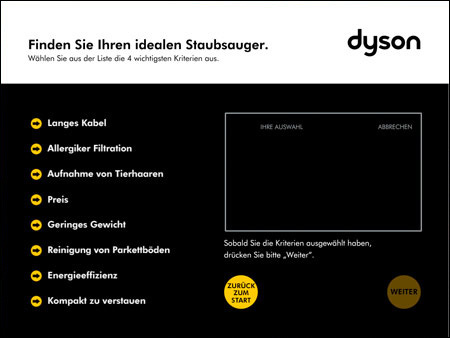 Requirements: Dyson wanted a retail kiosk for aiding customers choose the Dyson vacuum that best suited their needs. Solution: We created a desktop application suitable for running on the embedded XP kiosk. A local SQLite database allowed usage logging as well as allowing each store to configure the product range available. A management screen also allowed logs to be exported for central collation.